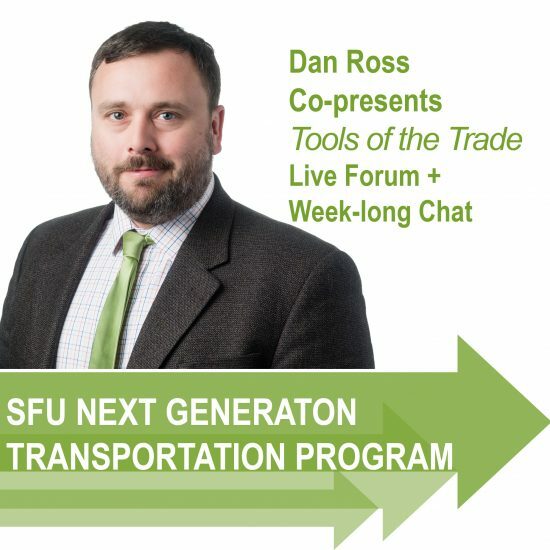 Dan Ross is co-presenting a course in SFU’s Next Generation Transportation Program with Darren Davies of Auckland (NZ) Council. This program’s course is called Tools of the Trade (NGTC102), a 12-week review of both the traditional and new analytical tools transportation officials (planners, engineers, and policy makers) use to make decisions about our infrastructure. Dan is the co-presenter of the penultimate module that ties all the previous weeks’ lessons and discussions together. The focus of the live chat taking place Saturday, April 14th and subsequent week-long forum is to discuss how the tools students have learned about throughout the course are successfully (and unsuccessfully) applied in the real world. Supported by Dan’s module presentation, Bridging the Gap: Strategies for Transit and Active Transportation, he’ll talk about the business cases NGT professionals need to assemble in order to employ these new tools in the face of ‘business as usual’ inertia and Gatekeeper entrenchment.